By Justin Lawler Developer. Biohacker. Organiser of @qs_dublin . Contributor at @Irish_TechNews see more by Justin here. Justin is co-organiser of Dublin’s Quantified Self Meetup, where we discuss the latest in HealthTech, self-tracking and biohacking. The next meetup is on gut health on 1st March. Healthcare in 2017 is not sustainable. The costs of treating chronic diseases and an ageing population are putting massive strains on our healthcare systems worldwide. It’s not just problems with our health. There are fundamental problems with the healthcare service itself. Human error is the third leading cause of death in the US. Only heart disease and cancer are more deadly. At the Dublin Tech Summit HealthTech stage, we got to hear about the latest innovations in healthcare – now and coming soon. eHeath Ireland was running the HealthTech stage during the day and talked about projects being run in Ireland now, including a genomic sequencing project for epilepsy for faster and better diagnosis. Digital Hospitals are an initiative coming out of Finland that’s improving overall care and reducing time spent in the hospital. Patients are sent home with continuous monitoring wearable sensors once treated in the hospital. Home care means reduced costs and better patient outcomes. Home care is far less stressful. Patients are no longer waiting in hospital beds, not getting any sleep. They’re in environments they know and can relax in. Wearable and portable sensors will also be huge in the wider health market. Take the MedWand for instance. – in rural areas; patients with house bound illnesses. Even just to remove the time overhead of doctor waiting rooms. Other devices discussed were Tytocare, similar to the MedWand and already in use in the US, and AliveCor, a portable heart sensor powered by the iPhone. AliveCor claims it’s possible to prevent 90% of strokes with regular monitoring. We’re already swimming in a sea of data, and this is only going to get bigger. There’s a coming explosion of data coming from patients. From blood testing to wearable sensor data to full DNA records. With large data sets, we can look for patterns in the data. We can detect illnesses long before symptoms become obvious. Data is incredibly valuable. Researchers are not getting enough of it. Speakers from the company Have a Heart for Health collect data donations from iPhone sensors. With that data, they’re generating apps to help with predicting heart disease. In the US alone there are an estimated one million people who have undiagnosed heart disease – this app is aiming to help these people. Speakers were very keen to point out that Machine Learning and Artificial Intelligence will not replace humans. They will augment humans. Machine Learning leads to less human errors and faster diagnosis. Teams are building apps that can predict epileptic seizures before they happen. Wearables are predicting illnesses 2-3 days before any symptoms in test teams. With many chronic diseases like diabetes, the earlier it’s detected the better. Wize Mirror is a device in development that will scan the users face every morning, looking for signs of diabetes among other chronic diseases like stress and heart disease. 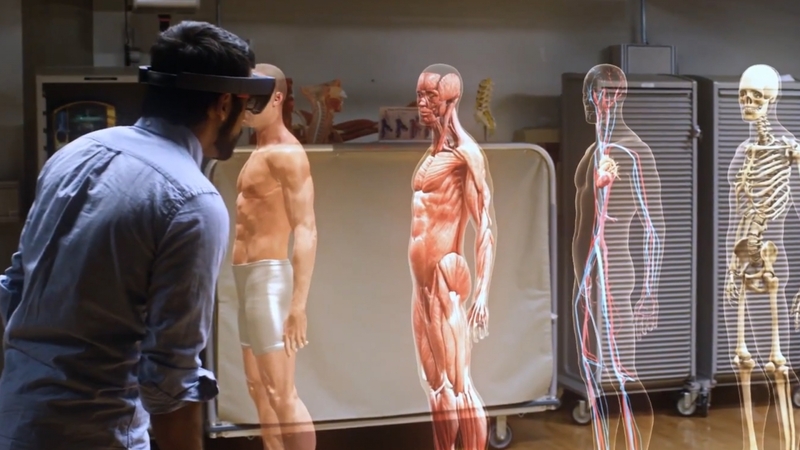 Augmented Reality – Training new doctors. Diagnosing disease. In the operating room. Drones – delivering prescriptions to your door. Music Therapy – HealthTunes has music to help with conditions from pain management to Parkinson’s to neonatal intensive care. What are the blockers for greater HealthTech takeup? In a word – trust. Patients confidentiality must be respected – whether it’s medical staff or MedTech companies. In a world where a patient’s health records are far more valuable to cyber criminals than credit cards (criminals are using health information as identification, and unlike credit card information, health information can’t be ‘cancelled’). But security is being taken very seriously, with technologies like BlockChain and customers controlling what data they share. With technology advancing at such a rapid pace, bringing so many innovations over the coming months and years – one thing for sure is that healthcare will look radically different in the future than it does now. And this can only be for good. Human error third leading cause of death in the US. Genomic sequencing of epilepsy in Ireland. Wearables are detecting when we’re just about to fall ill. The explosion of data coming from the latest in blood testing. Wize Mirror monitors for signs of disease. Microsoft detecting lung cancer from search logs. Next ArticleFour Resolutions to Change Your Life!